Save 20% off this trip. Expires April 22. Click here. Welcome to Nairobi, the world's only major city containing a game reserve. You'll meet your group at 6 pm but if you arrive early, perhaps jump on one of the Nairobi Urban Adventures. Just be sure to leave the 'From Farm to Feast' adventure for tomorrow. Once you've met your new travel buds, join them for an optional group dinner or alternatively strike out on your own. Your adventure comes to an end after breakfast today. A departure transfer can be booked, at an additional expense, to either Kilimanjaro Airport (JRO) or Arusha Airport (ARK). Alternatively, you can continue on with our crew to finish in Nairobi. This is an overland trip. 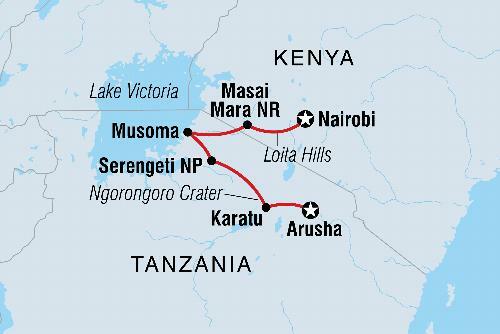 That means you’ll be travelling with a group in a purpose-built vehicle, visiting remote communities, occasionally roughing it in the bush with limited facilities, and getting the best possible views of the ‘big five’. While the vehicles don't have air conditioning, they do have sliding windows which let in the breeze and make it even easier to take spectacular snaps of the local wildlife. The drive days can be long, but it’s as much about the journey as the destination, and half the fun is the camaraderie.